So we all might have heard of the typical stereotypes of the French eating their grimy frog legs and more frequently are escargots (snails), and the mention of those “slimey molluscs” on any dinner menu immediately triggers a ‘yuck’ or two from a good number of my American friends. But mind you, they’re part of the street food specialties in Vietnam. Aside from a tiny bias here that it is perhaps one of my favorite pastime munchies that I’m literally almost always up for at any particular given time, snails here are diverse in the myriad of breeds living across Vietnam and they become much more than just, as infamously accused, “rubbery pieces of blandness” through the plenty of ways in which you can marinate/cook/grill/stir-fry/a la carte/’younameit’ them. 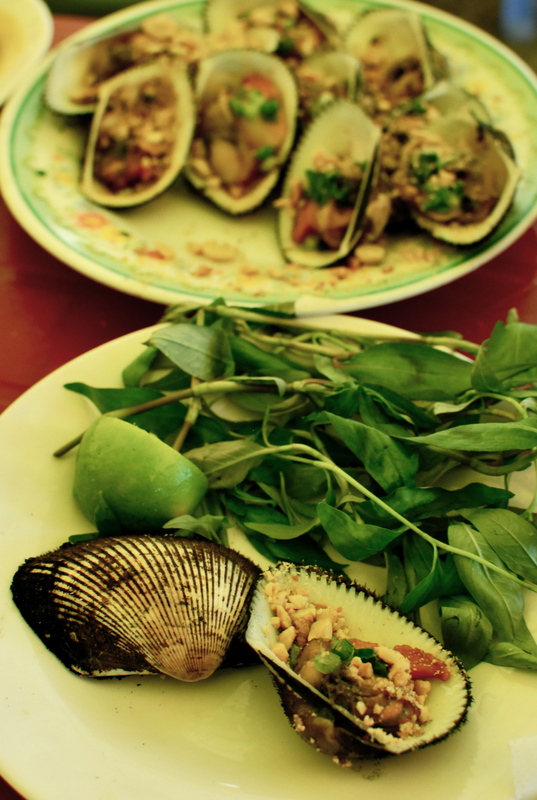 Anyhow, just when my palate thought it was quite, very much, satisfied with the ‘Quán Cay’ (Spicy Resto) alongside the Giang Vo lake _renowned as the snails foodie row here in Hanoi, I find myself completely stupefied at the abundance of scrumptious snail possibilities in Saigon. There are perks in having to go on business trips down to the southern metropolis every so often, you start to discover the greener, well another color completely of the culinary grass. The collection of southern snails are for a great part, very different from those you could find here in Hanoi. 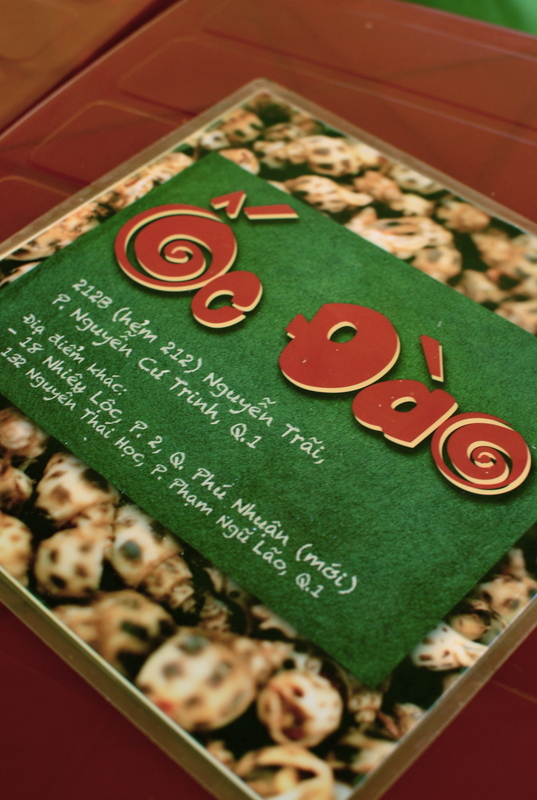 My newfound snail haven in HCMC is ‘Ốc Đào’. Well tucked away in a typically-Vietnamese-winding alley of Nguyễn Trãi Street, the resto’s headquarters, all under 2 umbrellas, consist of baskets full of different types of shell-fish, 1 or 2 cooks stir-frying on-spot, and a host of finger-pointing employees as to where you should sit. Behind the umbrellas, are two small rooms but the main eating area is across the alley, into a tent-covered yard with around 30 to 40 small plastic tables, and those tiny street food chairs that anyone above 1.8 metres tall who sits on them will immediately find his knees kissing his nose. The thing that sets Ốc Đào (not sure if Đào (peach) is the name of the owner) apart is the fact that it is an exclusively lunch-spot. This is very odd considering most Vietnamese people look to snails as a night treat. Nevertheless, as I had mentioned my ‘timeless’ love for these shell delights, this fact, for me and I’m guessing also for the amount of people flocking into the place over lunchtime, the fact didn’t matter. The matter at hands were the SNAILS! 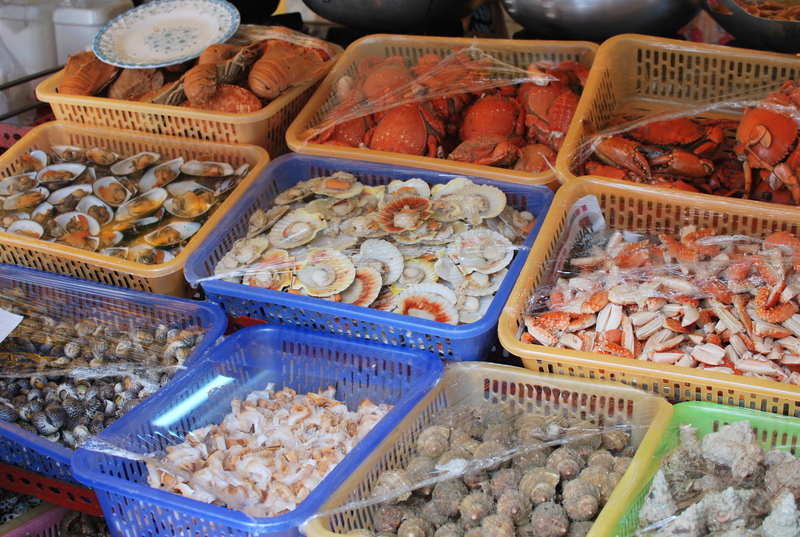 They are around 25 different types of shellfish on the menu (shrimps and crabs included)…some of the stuff I have never even heard of, everything ranging from tiny-looking snails ironically named ‘ốc ngựa’ (horse snails) to oddities like ‘sò lông’ (hairy clams) . There are some 13 different ways of cooking almost any particular snails, most scrumptious of which include, grilled with shallots and peanuts, stir-fried with tamarind, or deep-fried in butter and garlic. 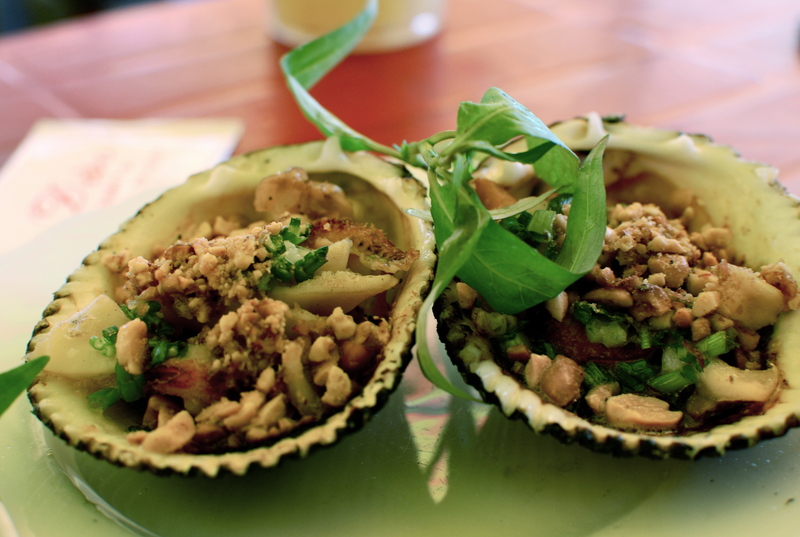 From 25,000 VND to 100,000 VND per full plates, depending on the luxuriousness of the snails, it’s definitely quite a budget yet sure-to-please street delight. sipping ice-cold sugarcane juice, twisting delectably marinated snails out of their shells, dipping them anxiously into crazily spicy fish sauce, and then easing those lovelies into your palate , one by one …. 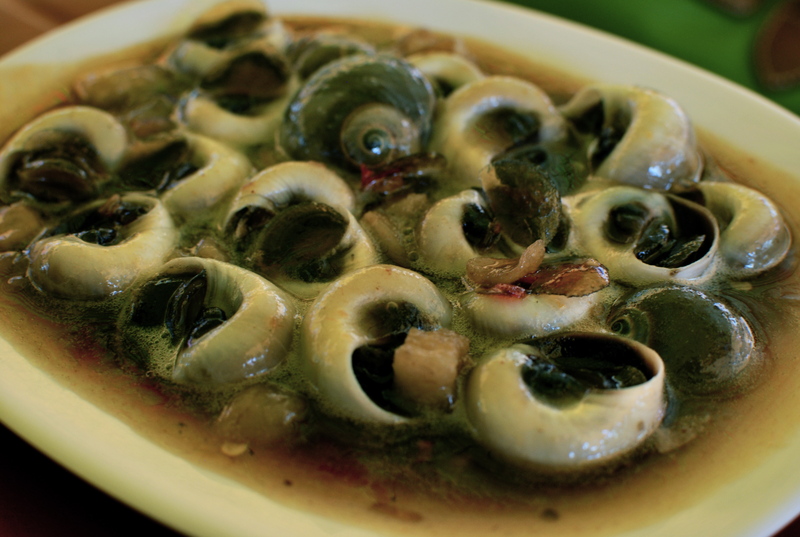 it’s an experience beyond any preconceptions you might have about eating snails! Enjoy photos taken on my second visit to the resto!